As some of you know, Tom Verni has resigned as Executive Director of GOAL N.Y. I had a look at his resignation letter and I'm curious about the following issue. What exactly happened at the close of the GLBT training session, that GOAL taught at the NYPD training academy, in June of 2008. Years ago, we went through the fires of hell in order to get GOAL into the academy to teach GLBT issues to the recruits. Is their now some kind of problem regarding this? It was just a matter of time before we'd start hearing about the internal bi*chfighting with that band of rats and snakes. The moral of this story is as has been said here, "When you lie with dogs, you get fleas". And regarding what "allegedly" happened at the Police Academy...well I heard what it supposedly was and I'll tell you that if it's true, certain members of the board should've been suspended on the spot. So now GOAL has been thrown out of the Academy and their long standing program of training recruits in LGBT issues has been discarded. Again, allegedly. Once again, shame has been brought upon GOAL and the gay community. I guess the Jaime Katz debacle crime wasn't enough. Seriously, why do some idiots around the country still want to align themselves with these dopes? And btw....did their host hotel ever take care of that bedbug problem they've been having the last few years? If GOAL is no longer teaching LGBT issues in the NYPD police academy, it means that all of the blood, sweat, tears and lawsuits we went through were for nothing. How could they let this happen? What the hell is wrong with those idiots? Their main problem is that they were more interested in promoting themselves than in promoting GOAL. The question should never have been "What can I get from GOAL?" The question should be, "What can I GIVE to GOAL?' They were never there for what they could give, only for what they could get. They never took care of the membership. They only took care of themselves. They have run this wonderful organization into the toilet and I'm very, very sad. Bedbugs? Well as Bette Davis once said, "What a dump!!!!! Strange indeed are birds that sh!t in their own nest. Well, finally at long last, slowly but surley GOAL's chickens are coming home to roost!!! Does anybody have a commercial Backhoe to help clean up this mess? I've watched this go on for a while. It is truly sad that the current state of affairs is what it is, but as I think I opined once before, GOAL maybe a product of its own success. 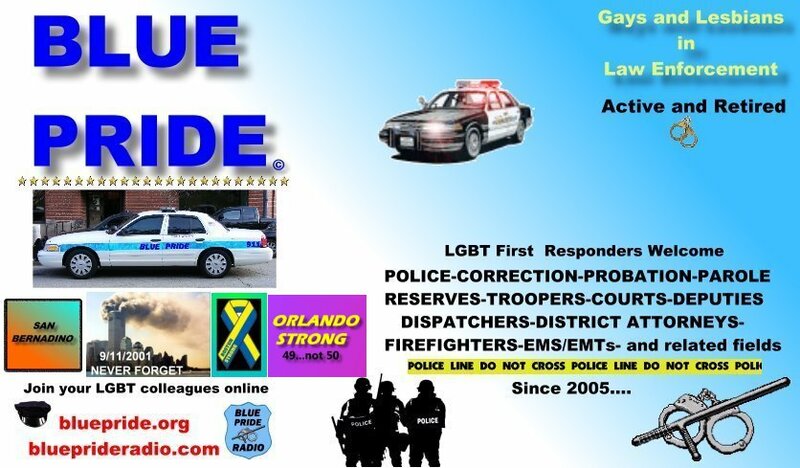 When GOAL was founded, a gay or lesbian officer would have to have been just about suicidal to out him or herself on the job, and the people who got GOAL started were indeed brave. While there are undoubtedly still some incidences in the NYPD where GLBT officers are not accorded the rights and respect they are due, the department has become a great deal more accepting of members from the GLBT community, undoubtedly due in no small part to the hard work of GOAL in the past. But with tolerance comes a disconnect. Without a clear cause to fight for as in the beginning, is it really very surprising that the organization has devolved? It's been a while since I've been a New Yorker, but all this sounds suspiciously reminiscent of the sort of stuff that happens in line organizations from time to time. I remember hearing stories about PBA boards and elections, charges and counter charges, etc. So I guess I'm not all that surprised. It is sad though when any organization loses sight of the welfare of its members and gets caught up in infighting. Sometimes these situations do right themselves. However, sometimes the only solution seems to be to go outside and "re-invent the wheel. " Unfortunately, the motivations and actuations of those currently seated on GOAL NY's board will have more significant reprocutions than those which have already been shown to occur. From the time the "Coups" was initiated it was obvious, and made know to all present at meetings that, those instigating and in support of the then, soap opera like take-over, was an ill conceived, sophomoric demonstration of ignorance, a zealous want of self-serving power, and an actuation of immaturity that baffles one to believe it could have come from law enforcement officers. Well, at near the school year's end, the chickens have indeed come home to roost. Unfortunately, it is not only LGBT people in GOAL and law enforcement generally, primarily those currently on the job, that now loose. The whole LGBT community in NY State looses - just when the marriage bill is on the line. And now, for the cherry on the "Right Wing" Sundae .... add Jamie Katz, a former GOAL-NY President to the mix! Goal-NY is now the idyllic "Right Wing" target for why LGBT people should not have equal rights. they are just too unstable: morally, ethically, psychologically, politically etc.. It takes more than a mere backhoe to shovel-up and clean-up this amount of defication. Twenty plus years of work, sweat, tears, job losses ... UNDONE! At one time, we were so powerful they were afraid of us. Today, GOAL has been reduced to a cheap carnival sideshow. It's like watching a childish rendition of ALICE in Wonderland with all of her crazy characters. It's like the Mad Hatter Tea Party with each clown more stupid than the next. It's like watching a train wreck in slow motion. Attending their board meetings must be like watching the Seven Dwarfs with delusions of adequacy. Oh I can just see her standing there saying," mirror mirror on the wall, who's the fairest of them all" . Poor thing, she's still waiting for an answer!! I really should not make light of this because It's a tragety. These cartoon characters have destroyed GOAL and the membership let them do it. Now, only the membership can fix it. They know what they have to do!!! Hey so thanks for the couple emails. I told my boss at work and he sent me to staples with petty cash. I picked this one. works great. Faster than putting in a rec for one..
Perhaps it will shred sour grapes too. I'm surprised and shocked at the behavior. I never expected it from you. I hope you handle the organization better than you handled this, P. It must be something in the water..... it's not like you. Enough of this bullsh*t. -admin. For those of you who don't know, I am the past president of GOAL NY. I stepped down in July of 2007. I received an email yesterday from the LGBT Center in Manhattan advising me, as if I was current president , that GOAL NY was 6 months delinquent in paying its rent on its meeting space. Not only did they not change the contact information with the Center, but they are not paying their rent..... And they call this RESPONSIBLE LEADERSHIP! Well that's interesting.. So you going to pay the bill. I don't think so .. That's a shame. They are supposed to set the example, ar'nt they region one... Looks like the train did derail in 2009 as in the pic posted on 4-28-09.